The Devdar Prayers - Ghumakkar - Inspiring travel experiences. Fading autumn and silent footfalls of coming winter have made these Devdar forests even more intriguing. Standing on a quiet road in Dalhousie in a cold and beautiful afternoon, we watched the widespread panorama of Pir Panjal with mute admiration. 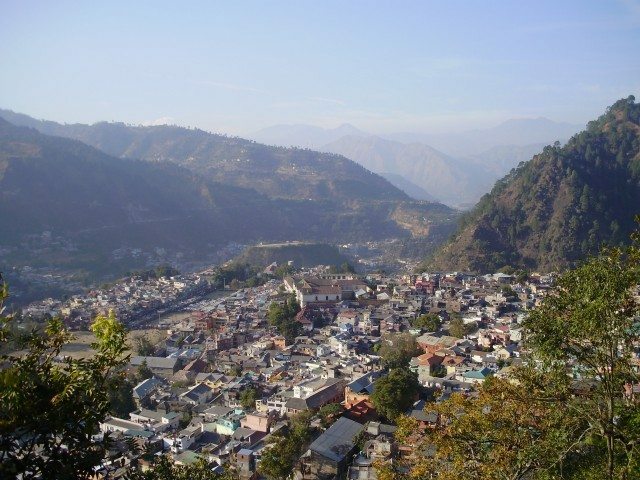 Dalhousie a sanatorium town built by British in 1851 is a favourite tourist destination. And why would it not be! The majestic Himalayan trees, the green winding roads, the snow capped mountains so close and all around! But our destination was further ahead. 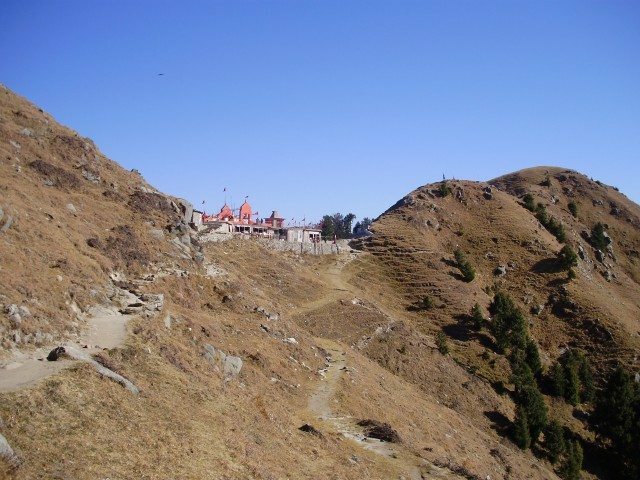 The beginning of this marvellous temple trail of North Western part of state of Himachal started with a smallest and most unknown of the places. DainKund is a name in Dalhousie tourist guide. The actual place is under Army premise and hence off-limits to regular travellers. But a certain ‘Pohalani’ maata mandir is something that anyone can visit. A short 1.3 km trek through some of the most amazing forests and mountains with nothing but silence as your companion was certainly an experience one would hold close to the heart. 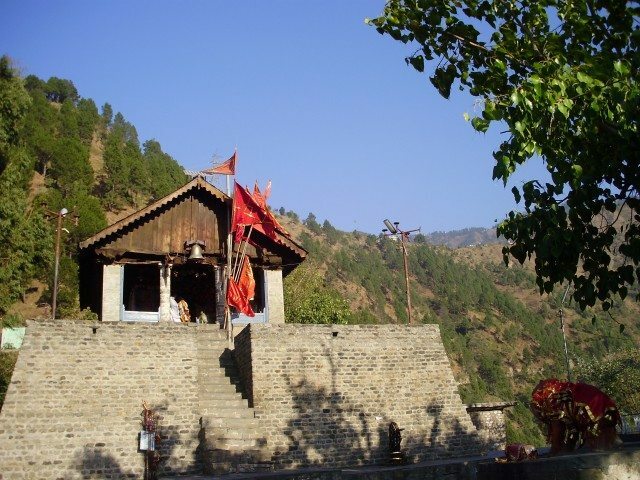 Pohalani Mata is the typical Himalayan spot of local deity presiding at a fairly difficult location. After some refreshing walk through pine woods and constant guidance of Pir Panjal range on the horizon, you come across an humble abode, all coloured in red brick tones with saffron flags fluttering in clear blue sky. It is a goddess with fierce face, probably Kali. The refreshing mountain air, the golden warm sunshine, the trees, the chirping birds, the snow covered peaks all under the wide blue dome, very silent and very there, for ages, unaltered and untouched! It was as if we were in heaven!. Down to earth from heaven, our vehicle proceeded through roads making inroads into sea of deodars. Crossing the valleys and forests our next stop was the famous Khajjiar. This is a relatively small Himalyan meadow and a small lake surrounded by mighty pines and devdars all around. One of the most favoured tourist stop was but a bit of disappointment. The meadow was dull and lake looked like a pit of stagnated water with lot of rubbish thrown around. And to add to it, there were stalls selling anything from popcorn to ‘buddhee ke baal’ on the meadow itself. May be it would be more enchanting when it is monsoon green or winter white. Here again a temple awaited us namely KhajjiNag. 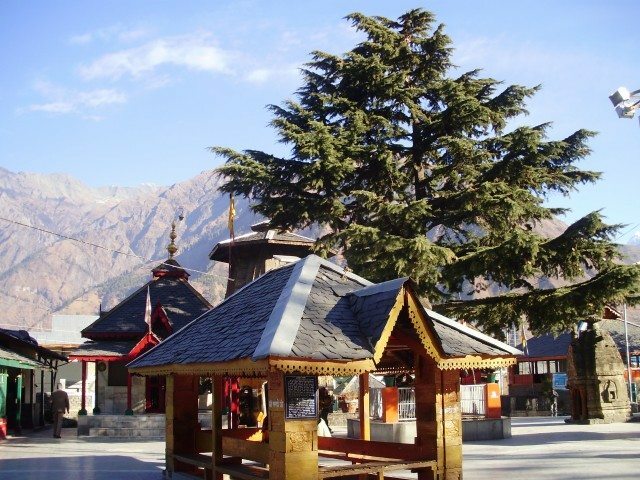 A typical Himachali temple in wood and sloping roof has a black stone idol of the Nag devta. Nag worship is quite common in this part of Himalaya with Khajji nag, BhagsuNag and many more. 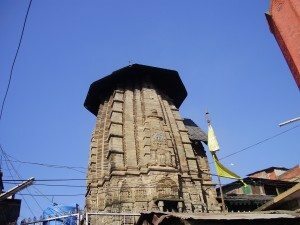 The LaxmiNarayan temple is actually a temple complex housing 3 large temples, 3 smaller temples and several even smaller temple like enclosures. The main deity is of course Laxmi Narayan, a form of Vishnu. A huge metal idol of Vaikunth Vishnu decorated with silks, ornaments and garlands looks impressive. Radhe Shyam and Laxmi Damodar are rest of the Vishnu temples in the shrine. Shiv-ji has equal weightage with 3 temples dedicated to him and Parvati which are Chandragupta Mahadev, Gauri Shankar and Maha Mritinjay. Although the temples built in fine Nagar style date back to 10’Th century, the idol in the sanctum are mostly from recent times. Vaikunth Vishnu is a form of Vishnu where iconography indicates 4 faces. The front facing is ‘Saumya’, the left face is the Varah (bore), Narsimha to the right and then there is Bhayankar face ‘Kapil’ which is not shown. Vaikunth form of Vishnu also co-relates to Chaturvyuh concept of Panchratra Samhita. There is abundance of Vaikunth idols in this area. History tells us Vaikunth idol from Laxman temple at Khajuraho was also brought from Kailash-chmaba region by King Yashoverman. Also prominent is the ‘trimurti’ sculpture on all temple shikhars. This Trimurti is not the usual Brahma-Vishnu –Mahesh or even 3 frontal faces of Vaikunth Vishnu. These are 3 normal faces, which very well could be part of Sadashiv’ , a 4 face form of Shiv idol, where fourth face is behind as in the famous Gharapuri (Elephanta caves) sculpture.. So we get an interesting combination of Shiva ji on Shikhar and Vishnu ji in Garbhagriha. This temple complex is right in middle of the town and you need to cross the vegetable market and then some more to reach the premise. But to reach the next temple, we had to pass through food stalls and blaring horns and vehicles roaring to earn place in parking lot. The temple site was almost hidden by big building next to it, and to entrance was obstructed by a fire engine at the doorsteps. Hari Rai temple is again a beautiful piece of stone architecture with an idol of Vaikunth Vishnu. 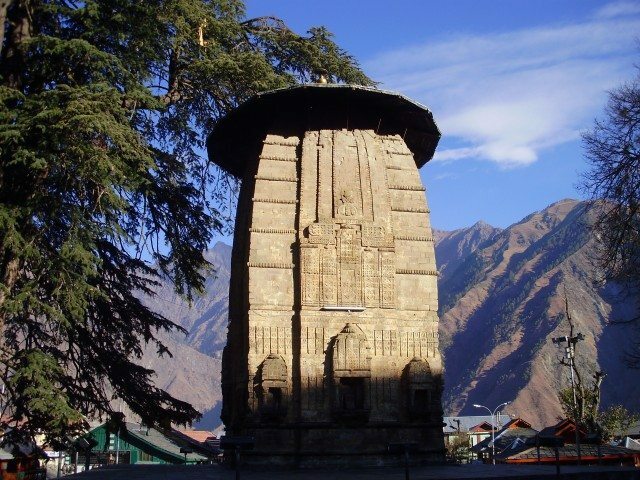 The temple is medium sized and has blended completely with the surrounding urban setting, except the marvellously carved tall shikhar standing out. It is sometimes frustrating to see the once lovely locations now turned into urban chaos all closing in to encroach on this piece of land which should be pure, peaceful and sacred. Even if we forget this ‘outside campus’ activity, the temple area itself is corrupted with electric wires wilfully going anywhere from anywhere, the marble and tiles un-intentionally glamorous against age old stone and jarringly coloured wooden structures juxtaposed against the most ornate of the doorframes. And yes, I do mean ‘corrupt’ because we fail hopelessly in basic aesthetics and just take a short cut to complete the need. Our modern day utility provision in temples, be it electrification or maintenance or crowd management infrastructure, all is done in very ‘kam-chalao’ fashion while completely neglecting the fact that these ‘additions’ are not complementing but spoiling the surroundings. Let us hope for the day, when we will spend some time in thinking about how to make things more beautiful rather than guilelessly make them ugly. A little hilly road took us from the busy Chamba to the secluded and windy temple of goddess Chamunda. Minimalist carvings and empty surroundings, with a backdrop of high rising mountains overlooking the Chamba town and green belt of Ravi, the wooden ‘Mandap’ with carved windows and hundreds of little temple bells, the clean and peaceful surround, only to be interrupted by gushing wind and sometimes the ringing bell, a beautiful location indeed. This temple again was built by Sahilwarman dating back thousand years. Listening to the rustling leaves of Peepal, we resumed our journey to the place which is beyond Chmba in the lap of Himalaya. The next day, after negotiating some dangerous curves along Ravi, we speeded up deep inside the mountains to reach the ancient capital of the region, Bharmour. Originally Brahmapur is a small town well protected from the usual tourist because of inaccessibility and lack of any popular tourist attraction. We were here to visit the ‘Chaurasi temple complex’. Bharmour is almost on the edge of a steep mountain looking over the Ravi river flowing through the gorge below. A typical hill town with religious flavour was still in morning slumber as we walked on a gentle gradient. Shops lined the road, still closed and morning sun definitely on the horizon was still behind the giant mountains. And then we entered a large area, paved and clean, quiet but charmed. In front of us was the tallest of them all, the Mani- Mahesh mandir with an equally tall devdar for company. Surprisingly the mandir door closes at 9 AM since it opens at 5 AM. 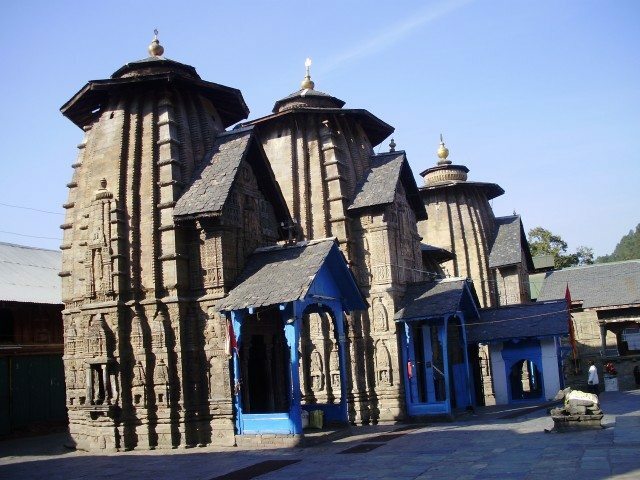 This is a large temple complex with a mix of 2 Nagar style temples, few wooden hill temples, several small stone temple structures and devdar and peepal trees scattered around. The ManiMahesh pilgrimage begins from here after taking the blessings from Man Mahesh himself. The temple has a high plinth, and inside resides a huge shivling. The trimutri figures adorn the front shikhar which is a usual in this valley. Another temple at the edge of this premise belongs to Narsimha. The temple shows slight tilt, could be because of the massive earthquake of 1905. 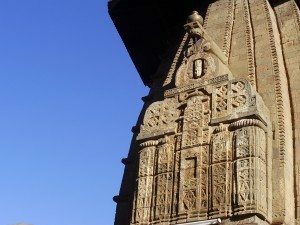 The interesting temple with beautiful wood carvings belongs to Laxana Devi. A copper plate inscription tells us that the temples are built by King Meru-Varman who was reigning in 8’th century AD. However it is not sure that temples really belong to that period or were reconstructed at later date. 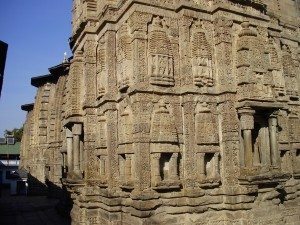 Looking at the similarity of style and architecture, they match with Chamba temples and hence can be placed in 10’Th or 11 century AD. Sitting under the peepal tree, watching the breeze swaying the huge Devdar branches and crisp golden sunshine lighting up the age old stone structures, the Kailash peak of Mani Mahesh standing still on horizon among the tall and taller mountain ranges, a lifetime could pass easily in this blessed and blissful surroundings. After visiting these gems hidden in the Chamba valley, we were eager to feast our eyes on one the most enchanting attraction of Himachal, the Masroor rock temples. 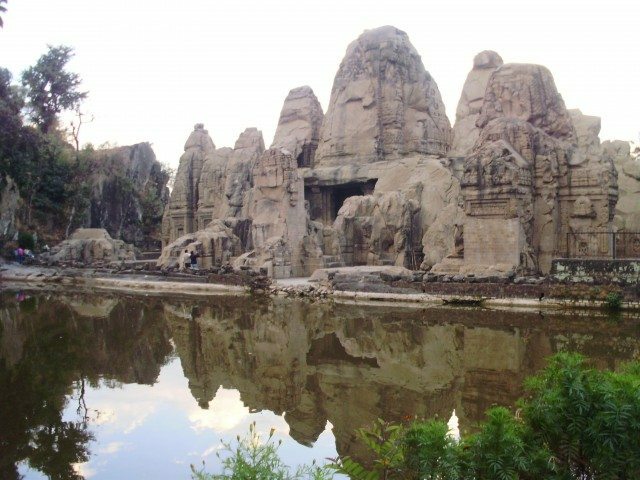 These are unique, since India has very few fully rock carved temples standing, the biggest and most celebrated being the Kailash temple at Verul. We travelled through un-ending hillocks and humble forests of Pine and other trees interspersed with small small villages. The Kangra valley enfolded in front of us, it was not as majestic as seen in higher Himalayas, and full of Pines and Devdars and steep climbs and deep valleys laced with snow capped ranges. It was modest and simple but not less breathtaking, the brown hills and fresh green pine leaves all swathed in warm afternoon sun, the litchi and mango orchards, the terraced fields of wheat and occasional mustard, the twisted turns and large expanse of golden valley all added to the charm. Masroor is little off the normal tourist circuit, and more so on that day since the main road going to Masroor was closed and we had to take a detour. Finally the massive stone sculpture was in front of us in all its glory. This is a formation of 15 temples, 4 large temples in last row and smaller 5 temples and front row and some more around it.. All carved in one stone probably between 8’Th to 10’Th century since the architectural and sculptural styles matches that of Elephanta caves near Mumbai. Nothing less than a marvel, these temples are more unique since the rock required to carve out such intricacies is not easily available in Himalayan ranges. 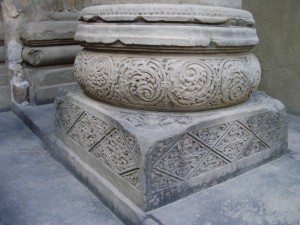 However this particular stone has been rock steady for years and has allowed the sculptors hands to adorn him with chisel. The imposing shikhars of larger temples are carved to depict ‘Nagar’ style with fine high reaching lines and intricate carvings. The sculptures include the usual ‘trimutri’. The main sanctum has idols of Ram, Sita and Laxman probably brought in at a later period. The main shrine also has staircases to reach the middle level. Part of the left side temples has fallen very badly and this could be due to 1905 massive earthquake in this area. The structure is unfinished and one wonders why it was abandoned. The small rectangular pool in the front is filled with serene water and this water presence gives a dreamy look to these magnificent and artful stone structures. . The figures carved in the temple walls are those of Shiv,Parvati and Kartikey. The beautiful floral designs combined with geometric designs weave magic for the viewers. Leaving Masroor was difficult. Nestled in Himachal, away from rest of the world, stood here such a unique piece of architecture totally off the radar for the usual tourist who does not even know what they are missing. Masroor temples would be best seen in the morning since they face easterly. Travelling back on curving mountain roads onto the flat plains of Punjab, this temple trail in Himachal was emotionally satisfying and more so with the fitting finale of rock cut splendour at Masroor. Very nice post with beautiful pics. For me , this is introduction to new places. Thanks for sharing. Lovely post with so much interesting detail and beautiful images. Your narration brought back memories of our trip last April to every one of those places you have so beautifully described, except that where you went to Bharmour, we spent a day at Sangini and Langera on the Kashmir border. I share your views on the lack of aesthetics with haphazard wires et al at the Lakshmi Nath group of temples. And likewise, Dainkund was our favourite too in the Dalhousie region. Since you have been to and enjoyed the temples at Masroor, you might be interested in the book by NK Singh : The Coronation Of Shiva in which he propounds that the original temple was dedicated to the coronation of Shiva with all the other Gods in attendance. Thanks Gita for your comments. Yes I do remember reading that Masroor is dedicated to marriage of Shiva, rather than coronation. However could not find sufficient references. What is special about Sangini and Langera? I would like to cover that part of Himalaya sometime, border of Himachal and Kashmir. Sangini [Sangini Pul is the name of the village] and Langera are very scenic places in the Bhandal valley. It was a sightseeing trip plus a ride down memory lane for my hubby who had been there on work some fifteen years ago. Thanks for showcasing the ancient temples in the Himachal region. These must be some of the very few extant temples of the pre-12th century era. In North India, most of the temples are of comparatively recent origin, hardly 3 centuries old, most probably reconstructions on sites where ancient temples once existed. I agree with you that little care is given to ensure that the aesthetics of these heritage sites are ruined by thoughtless sarkari employees who virtually desecrate these temples with their shoddy workmanship. We are truly unworthy inheritors of those glorious ancestors of ours who created these masterpieces. The temples of Masroor are truly amazing. Silent soul had written about them earlier. The picture you have taken of the temple complex looks spectacular and for a moment I thought that it was a picture of some Cambodian temple as it bears a strong resemblance to the Angkor. Thanks DL for your comment. Yes , I had read Silent Soul’s Masroor journey and promised myself to visit Masroor in next Himachal trip, which I did. Also you are very right about resemblance to Angkor temples. In fact there is a comparative study being done for Masroor and Cambodia temples. Beautiful beautiful post Manisha, loved the way you described each and every aspect of temples without being repetitive. I visited most of these 8 years back, and this post brought back all the fond memories of that trip. One of the great post at Ghumakkar. Most of these magnificent temples stay unknown to most of the the ordinary mortals like me. 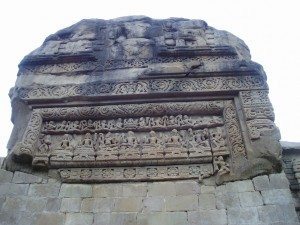 Not just temples but historical features associated with these temples make this post a superb. Thanks All for your kind words. Really appreciate it. Manishaji this was a beautiful post and splendid fotos. I think such important post should have been split into 2 or 3 parts to let us have more explanation and more fotos. Superb post with exquisite narrative. The lesser known (and thus more beautiful) destinations beyond Dalhousie have been covered here in all their glory. In addition to urbanisation, another factor is our disregard (or ignorance) for heritage-value. For instance, the state of neglect in which Subhash Baoli (on a road branching off before Panchpula in Dalhousie) lies is obviously because the authorities do not think the place to be important enough. Ironically, the place would have perhaps got more attention if it were a bit more urbanised. Linkages of Masroor with Cambodian counterparts is interesting. Thanks SS for reading and rthe advice. Mukund, glad you read it. Aurojit, the toursim departments neglect is everywhere for us to see. Great log Manisha. I very well remember your logs on Khajuraho (Poetry in Stone) and the details. Captions would have further added to the beauty of the pictures. The Masroor temple pic does look a bit gloomy, may be it is to me with me, Delhi Winters and no Sun today. 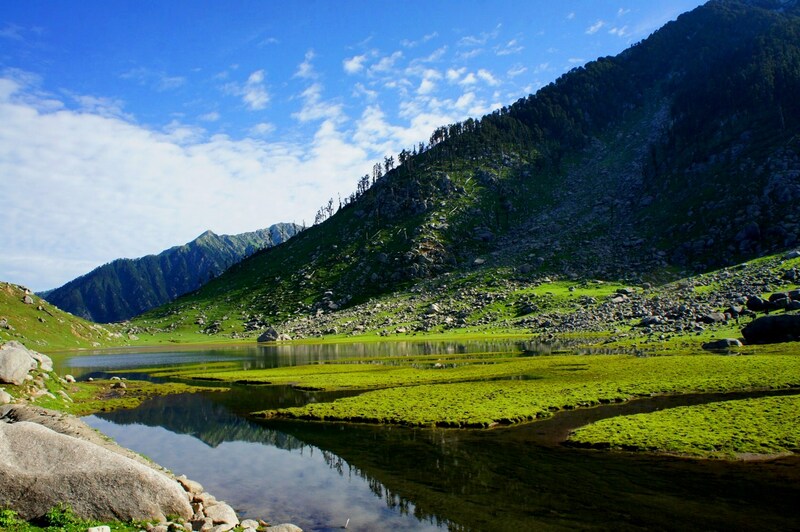 @ Gita – I have been fancying about driving to Bhadarwa Valley of Jammu from the Chamba side. I am sure there was some connection. 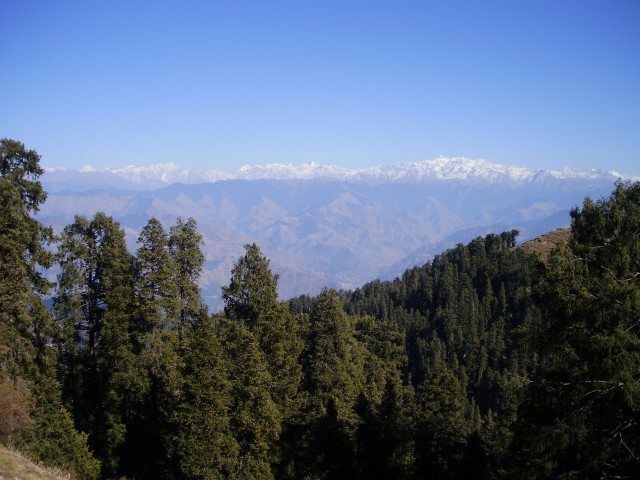 Would you know whether Bhandal Valley is the ‘Himachal Side’ of such a connection. And was there a connection to Jammu side ever ? The Bhandal Valley is on the Himachal side, at least where we went was certainly on the HP side. The same road [Chamba – Koti – Sundla – Salooni – SanginiPul – Langera] does indeed go on to Bhadarwa but there is one minor little hitch ……… the ITBP does not encourage outsiders to proceed beyond Langera. There have been some questionable intrusions in the past according to the ITBP men we chatted with there at that time. In the present scenario I would imagine they are all the more strict. At that time we could not have gone further in any event as the road was blocked with a huge glacier! If you have any military connection, you could try and get permission to go through on this route. It is not a blanket ban as far as I understood. Gita, sometimes definitely would like to explore that part of Himalaya. Nandan, Thanks for comments. Masroor photo does look gloomy because of low and against light. Hence I have given tip to future travellers to visit Masroor in the morning. Incredible temple at Masroor. I did not know these ancient existed in the Himalayas. DL is right – it does look like Angkor. I share your anguish about the grotesque things they do to the temples, wires et al. It is same everywhere. I visited Khajiar two years ago. The grass was green and the pool being cleaned. I guess things are just going to the dogs everywhere. Thanks for sharing your interesting and informative thoughts and beautiful pictures of this wonderful place with the majestic temples. Added this to my wishlist now!! !